We love all different types of food, almost anything Asian – Japanese, Thai, Chinese, Malaysian, Korean you name it we will eat it. And because these restaurants are not found in our area, I have had to start making my own. Necessity is the Mother of Invention! These are Thai Spring Rolls. The biggest problem is getting the spring roll wrappers. A good soul brought me a package from the US and I use them sparingly. The other item I am having a hard time finding is Hoisin Sauce. A while back I could always find it on the shelf in Super Maxi but my past several trips including one to Guayaquil I could not find one jar. Well making Hoisin Sauce will be left for another post. prepare shrimp (langostinos) by boiling with the heads on in water infused with seasonings like bay leaf, peppercorns and / or hot pepper flakes for 10 minutes. Drain, run under cold water until cool, clean and cut each shrimp in half. Put in refrigerator until ready to use. Cook rice noodles, cool under running water, drain and set aside. Shred all vegetables and set aside along with the herb leaves. Small individual dishes work great for this. Mix the peanut butter and water together over low heat, add the rest of the ingredients once the peanut sauce is blended thoroughly. Taste for spice and sweetness adjust for your palate. The sauce should be thick, sweet and spicy. Clear an area on your counter, clean it and arrange your bowls with the vegetables at the top of the counter. Take a large plate and add water to the bottom of it. 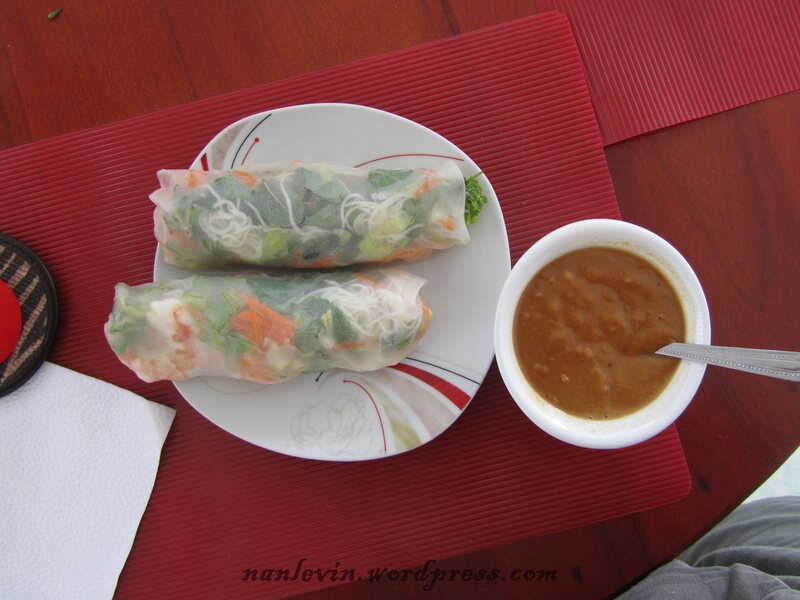 Take each spring roll wrapper and gently sprinkle water over both sides. Do not use too much water. This takes a bit of practice. They will still be a bit stiff, they will soften up while you finish all four wrappers. Lay the wrappers down in a row going from left to right. With your plates of veggies above also going from left to right. Start with the wrapper furthest to the left. Placing shrimp in the lower half of the wrapper leaving both ends empty. Do all 4 with the shrimp distributing equally. Then add the leaves evenly over the shrimp, continue with the carrots, lettuce and cucumbers. It works better if you do each wrapper with each additional ingredient this way you will distribute more evenly on each wrapper. Do not overfill the wrappers or you will not be able to roll them. Starting at the bottom or the wrapper peel it off the counter gently, while stuffing the ingredients pulling the sides in until you have a neat roll with all the veggies inside. This entry was posted in Beach, Cooking, Ecuador, Food, Herbs, Hoisin Sauce, Langostinos, Peanut Butter (mani), Peanuts, Peppers, San Clemente, Seafood, Shrimp, Spring Rolls and tagged Beach living, Cooking, Ecuador, Expats, food, San Clemente, South American by Nancy Levin. Bookmark the permalink. Looks yummy. Spring roll wrappers look to be an ongoing problem. Good news – they freeze. Portion and freeze. Thaw in fridge.